The Alliance Française of Durban and eThekwini Municipality presents the fabulous, free sixth annual Francofête on Human Rights Day which takes place at the Alliance in Morningside on March 21, 2017, in two parts – a day time family event from 10h30 until 16h00 and an evening sun-downer music concert featuring an array of Francophone world music, from 16h30 until 20h00. The ever-proactive Alliance Française uses this annual opportunity to showcase some of the best French; Francophone and French-inspired music; dance; theatre; story-telling; workshops; visual arts; and of course wonderful food and crafts in the alfresco market. The day culminates with a free music concert with a four band line up starting from 16h00 while the sun sets. The evening concert features iconic Malian band, BKO Quintet. Also on the bill is SA Roy and Forest Jam – seven piece innovative Swiss / Malagasy music collaboration. From Durban comes The Meditators, performing their own brand of fusion reggae. The full line-up has come together to showcase collaborative musical talents and to bring people together through their music. To ensure that festival goers won’t go hungry, Fusion French Café will be co-ordinating the KZN leg of the third Goût de France / Good France which will celebrate French gastronomy in various locations worldwide on March 21, 2017. Over 1500 chefs on all five continents are expected to join the event. This concept will be brought at the Francofête Human Rights Day Festival, again this year. Alongside the Goût de France / Good France stalls, will be the Swiss Food village which offers authentic French-Swiss fare, a taste of homemade bakeries, French delicacies and local cuisine. 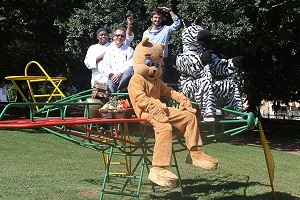 During the day, from 10h30 onwards, there will be family activities. There will be a full programme on the Assitej youth stage – face painting, gumboot dance, kiddies drawing corner, story-telling, dance and music. On the park lawns, there will be a series of activities, such as dance programmes featuring various groups and interactive workshops facilitated by our MC, Iain Ewok Robinson. “The Francofête celebrates diversity and tolerance on the occasion of Human Rights Day and Francophone week, bringing together all walks of life in Durban, transcending through all cultures, generations and communities. We look forward to a festive day of social cohesion in English, isiZulu, French, Swahili, Créole, sign language, and more....” says Alliance Francaise de Durban Director, Vincent Frontczak. “If a day out with the family is on the cards join us for the family programme from 11h00 until 16h00, bring a blanket, pack your picnic baskets and settle in for a day of fun. If listening to great music and getting into a sun-downer party mood is your preference then join us from 16h00 to 20h30 for the Sundowner Concert programme. In both cases, the craft stalls and food stalls will be available,” enthuses FrancoFête Human Rights Day committee member, Themi Venturas. There will be a day-long market which offers clothing, handicraft, decor items and gift ideas; taste some authentic cuisine and take time to become acquainted with some worthwhile NGOs who will have info stands at the market, all the while relaxing in one of Durban’s beautiful suburban parks. Alliance Française is grateful to the eThekwini Municipality, the French Institute of South Africa, Foundation Alliance Française, the Embassy of France in South Africa, Stratostaff, Assitej SA, the Embassy of Switzerland in South Africa, the Swiss Art Council Prohelvetia, Forest Jam, and the Reunion Island Province. Francofête takes place on Human Rights Day, March 21, from 10h30. Entry is free and all are welcome! The Alliance Française is situated at 22 Sutton Crescent, Morningside. For more information contact 031 312 9582. NB: The event was originally planned to take place in Sutton Park but is now happening at the Alliance.